The 36th annual NAIA Pow-Wow & Fall Festival held October 20 through 22, 2017 at Long Hunter State Park in Middle, Tennessee continues to be a celebration of American Indian culture. This popular event offers folks the opportunity to experience Native American arts, clothing, crafts, food such as fry bread, jewelry, life and more in a family friendly environment under the wide open sky. Dance, demonstrations, education, music and storytelling are also part of the festivals. Gareth at the 36th annual NAIA Pow-Wow & Fall Festival. Each October, Indians of different Nations gather at this Pow-Wow to share part of their culture. This spirited event is not just for the reunion of family and friends, but for anyone who would like to witness and join in the celebration of the culture that is nurtured by some 19,500 Indians who call Tennessee home today. The Fall Festival is sponsored by the Native American Indian Association of Tennessee (NAIA) which was established in 1982 to assist people with issues since there are no reservations in the State and no official programs available in Middle Tennessee to address the many needs (as identified by government and social agencies) of the Native American Indian population. We arrived before 10 am on Saturday where staff was already on site to manage the parking at Long Hunter. Throughout the grounds there were picnic tables and some bleacher seating around the ceremonial circle although many people brought their own chairs. We were in place for Sally Wells’ opening remarks and prayers but one of the main reasons we wanted to be there at start time was to see Gareth Laffely perform at 10:15 am. Gareth Laffely is a 19 year old multi-instrumentalist, songwriter, and producer from Gallatin, Tennessee just outside of Nashville. 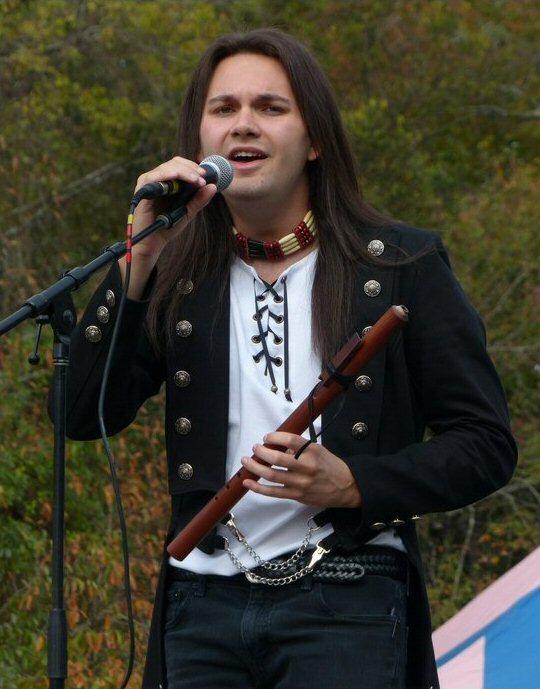 He is an award winning Native American flute player, Gareth is of Mi’kmaq/Cree descent. Young yet in many ways an old soul Gareth is an expressive player who addresses tough issues in tender tones that are heartfelt and healing. Gareth uses his musical gifts to bring people joy and he often donates part of his proceeds to non-profit organization such as St. Jude Children Hospital. Laffely also released his track This Time to be used as the anthem for the anti-bullying campaign that he brings to K-12 schools. He combines the message of the song with a challenge for students to get involved with causes that help make their communities a better place. “Great to be back,” greeted Gareth as he took the stage at Long Hunter. He shared that his song “Spirit Horse” was based on one of his favorite legends. Laffely used some piped in music to craft a fuller sound to support his crisp, compelling flute playing on this spirited tune. “Blood Moon” was also moving as Gareth sang and played the flute. Gareth mentioned that he often visits family in Maine and the next tune incorporated English and French words along with bird calls inspired by that northeastern state. Somehow he played two flutes at the same time to emulate the critters conversing. Laffely told us that one of the flutes he was playing has a history that goes back thousands of years. On the courtship flute Garth melded what he called “traditional and less traditional stylings” to craft a sound that would have been sure to lure a potential bride out of her teepee. “Dare To Dream” is another song Gareth is using as part of his anti-bulling campaign. As the title implies it’s an encouraging composition that dares listeners to chase their dreams. “Flutitude” was fast and furious. On a more serious note “The Journey” honored the sprits of the Indians who were forced out with many of them dying on The Trail of Tears. Gareth’s music was mesmerizing. He had a dramatic stage presence yet was down to earth as he chatted between songs about his muse. After the Opening Ceremony, Anthony Thompson told us about the Green Corn Dance then he demonstrated how to use a stick ball and rabbit sticks before inviting kids of all ages to test their skills on these tools. The hoop dancer was also engaging as he crafted animal shapes by combining movement with the hoops. Around one p.m. dancers in regal regalia entered the ceremonial circle in the Grand Entry living up to the event title. In additional to Gareth another well-respected musician performed at the Pow-Wow all three days. 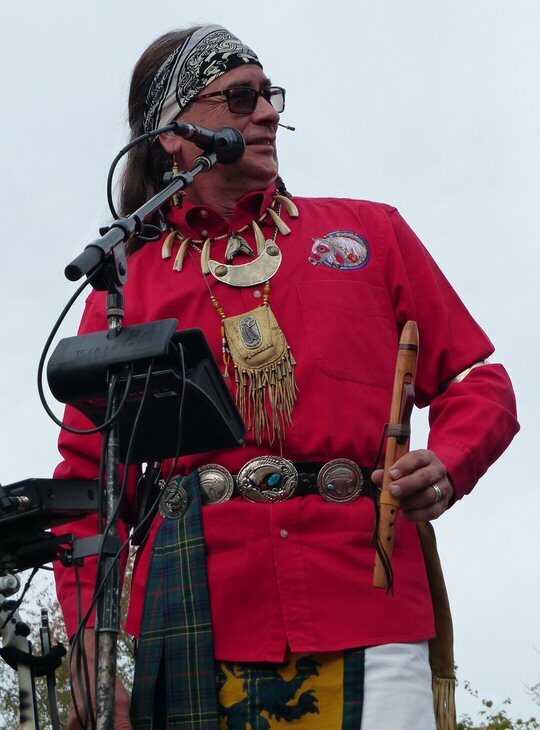 Arvel Bird’s “Celtic Indian” brand is a reflection of his mixed-blood American Indian and Celtic heritages – with his fiddle, Native flutes and Irish whistles, Arvel weaves a powerful tapestry of music and stories. Classically trained on the violin Arvel blends bluegrass, Celtic, folk and rock with traditional Native American music to create a sound that is innovative and unique. Bird proved why he has been called “Lord of the Strings” as he presented a potent set that ranged from peppy to personal. Bird was apt on both the fiddle and flutes. He touched upon being abused as a child in “Dark Horse” but said that he was saved by the violin. Arvel has used music to heal himself and others. He also advised listeners that changes are coming and that we need to clean ourselves so that the world can change (for the better). Bird was both educational and entertaining on Saturday. The Fall Festival featured a wide array of artisans such as Wazhushk House. Demonstrations and plenty of food were also offered. Gareth had a stand where he was available to sign CDs and happily answer any questions folks might have about Native American flutes. Quality vendors, cultural activities, dancers and musicians such as Gareth and Arvel certainly added a Wow factor to the 36th annual Pow-Wow! Arvel Bird at the 36th annual NAIA Pow-Wow & Fall Festival.